Deliveries from Tuesday to Saturday, excluding bank holidays. Free from 100 euros purchase, receive your parcel from a merchant close to you among the 6300 relay points of the network Mondial Relay (France, Belgium and Luxembourg). To find the nearest relay point, click here. Delivery time of 48 hours. You wish to be delivered to the address of your choice? Opt for the Colissimo. Would you like to pick up your parcel in our workshop located at 21 rue droite in Millau? No problem, you will appreciate seeing the workshop and the people who made your gloves. Delivery by Chronopost 13h and pick up points. You're in a hurry and want to be delivered within 24 hours ? We offer the services of Chronopost for an ultra fast delivery (from 7.50 euros in relay point). This service is offered from November to January, only during the winter period. As soon as your package is shipped, you will receive an email with a link to the tracking number. You will be able to follow in real time its routing. Glove with a lace of leather braided on top of hand for an absolute seduction! Possibility to choose the color of the glove and the braid. Call your glove according to your taste and choose your lining. 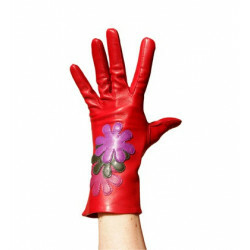 Lamb leather glove. Artisanal manufacture. We deliver gloves in a nice flannel jacket. We use exclusively linings 100 % silk, 100 % cashmere or 100 % rabbit. Silk: it is about a natural textile fiber which allies comfort and heat. To favor to keep a fine hand. Cashmere: it is a soft resulting pure wool of goat of the province of the cashmere. This lining is more thick than the silk. 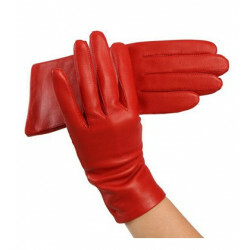 Rabbit: it is a second glove of an extreme sweetness which goes up to the fingertips. Consisted of the skin and the fur of the rabbit, it associates exceptional comfort, elegance and an incomparable heat. Constituted of a cotton mixture and a polyester high quality, the thread is flexible and elastic. This allows to obtain resistant sewings in the movements of the hand. Apply the tape measure on top of the hand by holding it with your thumb and covering the knuckles . Go round the hand with the tape measure taking the inside of the palm but without taking your thumb . Close the hand and note the measure without clenching too hard . Then check the measure in the table below to find out your glove size. How the scan of my hand ? You can also draw your hand. Vous souhaitez ajustez le gant choisi Ã vos doigts ? Pour cela, merci de nous fournir un scan de votre main qui nous permettra de rÃ©aliser ceci. The reviews are checked before publishing - read more in our Conditions of use. and offers tailored to your interests and measure interest in our services. For more information and set cookies, click here. This color cannot be seen under this angle.